Chemical attack’ in Idlib kills dozens – Kenyatta University TV (KUTV). All Rights Reserved. At least 35 people have been killed and 60 wounded in a suspected chemical attack on a rebel-held town in north-western Syria, a monitoring group says. Local opposition activists and news sites posted photos of those it said had died of asphyxiation. The Syrian government has repeatedly denied using chemical weapons. 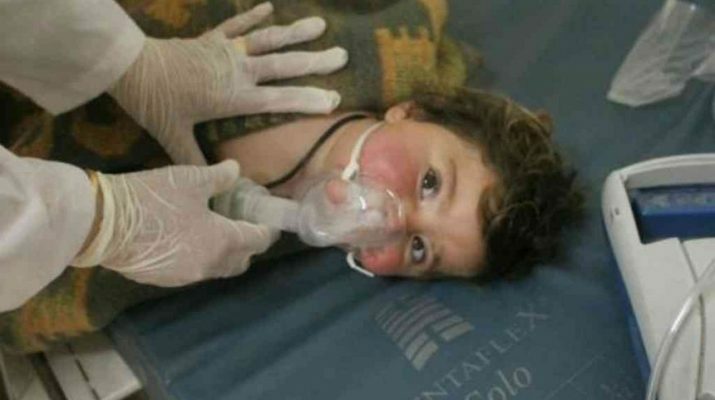 However, an investigation by the United Nations and the Organization for the Prohibition of Chemical Weapons concluded last October that government forces had used chlorine as a weapon at least three times between 2014 and 2015. It also found Islamic State militants had used the blister agent sulphur mustard. The Syrian Observatory cited medical sources in Khan Sheikhoun as reporting that the symptoms among those affected by Tuesday morning’s attack included fainting, vomiting and foaming at the mouth. The victims were mostly civilians, and included at least nine children, it said. The pro-opposition Edlib Media Centre (EMC) posted a large number of photographs of people receiving treatment, as well as images showing what appeared to be the bodies of at least seven children in the back of a pick-up truck. It was not immediately possible to verify the images’ authenticity. Idlib province is largely controlled by an alliance of rebel factions and the al-Qaeda- linked jihadist group, Hayat Tahrir al-Sham. The region is regularly targeted in air strikes by the government and its ally Russia, as well as the US-led multinational coalition against IS.